We have 0 member(s), 3 spiders, 50 guest(s), and 0 anonymous users online. Hey y'all, finally a new one from me This one was lots of brushing and painting, along with a bit of 3d modeling thrown in there too. 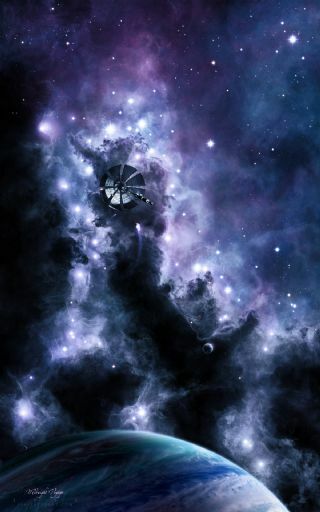 Backstory - In the dusty depths of the Midnight Nebula, an unusual craft appears. A solar sail, which by it's worn appearance appears to have been drifting for some time, slowly nears the gas giant Vidar. When there is no reply, two armed patrol ships from the Collective naval base on the moon Thrym are dispatched to investigate. By the direction it was travelling the solar sail seemed to have come from the nearest habitated worlds, orbiting the star Atea, 16 light years away. This could mean trouble, since there has been little contact with the New Polys since the war began there. The Atean system had been simmering with tensions between the different factions for years, but recently it had flared into a brutal hot war. Both sides had poured resources into developing weapons, and their success had been frightening. Nuclear weapons had long ago become the standard warhead for ship to ship missles, but now they had been repurposed to planetary bombardment of civilian areas. Advanced physics had been bent toward a devastating purpose, the quick and painful annihilation of the enemy. Viruses had been developed, both biological and technological, and let loose into the planetary net. These viruses had been the favorite weapon of one nasty faction of enemy, the captain said, shaking his head slowly. Artificial Intelligence had been considered the cutting edge of technology before the war had exploded. Now this AI tech had been incorporated into the viruses programming with particularly malicious results. Whole colonies had been wiped out. Once infected, humans with net implants, a common accessory for communication and data access, would be under the control of the virus, in effect creating armies of mindless robots or zombies - but zombies trapped inside their own head; as the host carrier remained aware and conscious. These carriers, once infected, would work to achieve the goals set up in the virus' programming, but would do so without alerting anyone to their infection by using the hosts bodies own memories and personalities. What this meant among civilians was a bloodbath as they were usually simply directed to eliminate their neighbors, family and friends. This was seen as such a vicious method of killing that public opinion quickly turned against the virus creators. But for the majority it was too late; their system was turning into a killing ground of crisped moons and glittering debris fields where habitats used to orbit. These solar sail refugees had struck out on a last ditch effort to escape, by building a simple craft like a solar sail they had avoided attracting the attention that the buying or stealing of, say, a couple of Alcubierre warp drives would have done. They constructed a laser station on a cold splinter of rock far on the edges of the system, and were lucky enough to set off without attracting more attention than a lone patrol ship pilot with a slow trigger finger. After a long, cold, silent voyage, they had arrived here, at the edge of Collective space. Welcome to the header (again! ), Brian! Simply beautiful brush work on the nebulae, and very nice modeling as usual on the human artifacts. And I like the subtle way you worked your signature into this one. Thanks to those who nominated this image for the header! A belated but appreciative thanks Tom! is that a painting or its a real picture? Man look im sitting here in Poland at the moment trying to write correctly in english. I wanna give you an animation below. I can stretch it 10 min. And you will write a story to that animation and i paste the text to the animation part after part and we will make some simple animated story. Take are Bro. hadzi3 - nice! I like your video!